Stalking Horse Bid - What Does It Mean? What is a stalking horse bid? 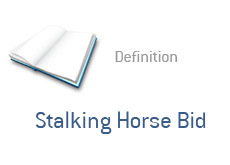 What is the definition of a stalking horse bid? "Stalking horse bids" take place during a bankruptcy. Let's say that XYZ, Inc. has filed for bankruptcy. and they will now begin the process of liquidating their assets. XYZ, Inc. wants to maximize the amount of money that it receives for its assets, so it will pursue something known as a stalking horse bid. XYZ, Inc. will select a company from the list of interested buyers to submit a stalking horse bid. This company will offer up a price for the assets. This is known as the "stalking horse bid". Other companies will then have a chance to best this offer. Why would a company choose to submit an initial bid? Often the bankrupt company will offer a perk to the company submitting the "stalking horse bid", such as breakup fees. This initial "stalking horse bid" will set a minimum price for which the assets can be acquired. This prevents companies from submitting a bunch of lowball offers in an attempt to purchase the assets for a song. The bankrupt company benefits from a "stalking horse bid" in that a minimum price is set for the assets. The company placing the "stalking horse bid" will usually benefit in that they will receive some sort of a perk for bidding first.